Formed in Birmingham in 1961, The Rockin' Berries spent much of the next two years in Germany, where they added two saxophonists to their ranks. As their name implied musically they took their inspiration from rock'n'rollers like Chuck Berry. When they returned to England they signed to Decca in 1963, though their first two singles flopped and there was a lapse of almost a year before they tried again, this time with Pye's Piccadilly label. Their label debut, I Didn't Mean To Hurt You, was a minor hit, but their big breakthrough came after they met Hollywood producer Kim Fowley who played them a song called He's In Town by an American band, The Tokens. Realising that this was a much more commercial offering they rushed out a cover version, which climbed to No 3 in the UK Charts, but at the same time halted the progress of their debut release. Turton's falsetto vocal style on this disc soon became the group's trademark. The Ivy League wrote them Funny How Love Can Be, which was an ideal follow-up for Turton's vocals but for some bizarre reason Piccadilly vetoed this idea in favour of a revival of Jack Scott's 1960 hit, What In The World's Come Over You. That was an OK song which gave the band a minor hit, though ironically the Ivy League took Funny How Love Can Be into the Top Ten themselves. 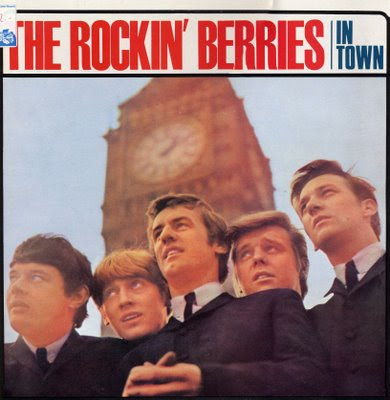 The Rockin' Berries had one more big hit with a good cover of US combo The Reflections' Poor Man's Son. This found Lea's low vocals vying with Turton's falsetto and was notable for an unusual guitar section. Thereafter it was all downhill commercially - they enjoyed just two more minor hits with You're My Girl and The Water Is Over My Head. Their first album, In Town, sold pretty well and climbed quite high in the Album Charts. The follow-up, Life Is A Bowl Of Berries, was rather disappointing containing songs like The Laughing Policeman and Iko Iko. Still the band seemed to have made contingencies for this eventuality for as early as in 1965 they made their debut in a pantomime season at Great Yarmouth. Subsequently they introduced comedy routines and impersonations by Clive Lea into their act. In 1967 Lea left to become a solo impersonator and by the late sixties the group were concentrating on comedy, TV and cabaret. Turton later went solo under the name Jefferson (as well as recording a 45 under his own name) but eventually ended up working in the hotel business. The remaining members continued as a popular cabaret act well into the eighties.